CHICAGO, IL--(Marketwired - Nov 20, 2014) - The latest TransUnion Industry Insights Report found that total outstanding credit card balances increased by 4.3% in Q3 2014 from Q3 2013. This signals the second consecutive quarter of significant annual growth and it constitutes the highest growth rate observed since Q4 2008. Interestingly, this increase in total balances occurred while the average credit card debt per borrower remained unchanged, increasing slightly from $5,239 in Q3 2013 to $5,249 in Q3 2014. The combination of these findings indicates that the current momentum in total balances may be driven by new entrants to the credit card market. In fact, the number of consumers with access to a credit card increased by almost 6 million from Q3 2013 to Q3 2014, to nearly 156 million. At the same time, the national credit card delinquency rate (the ratio of borrowers 90 days or more delinquent on their general purpose credit cards) remained relatively steady in the last year, declining from 1.36% in Q3 2013 to 1.34% in Q3 2014. The TransUnion report showed a quarterly increase in both the credit card delinquency rate and average credit card debt per consumer, which are believed to be reflective of seasonal effects. "Seeing the highest rate of growth in credit card balances in the last six years in such a low delinquency environment is an encouraging sign for the card industry," said Toni Guitart, director of research and consulting in TransUnion's financial services business unit. "The combination of a stable delinquency environment across consumer segments and significant amounts of new entrants in the card market, point to a positive momentum dynamic that has not been experienced since before the Great Recession." The outlook from some of the nation's largest metropolitan areas appears even brighter. For the most part, delinquency levels declined on a yearly basis at a greater clip than the national average. Leading the declines were Boston (-11.6%), Miami (-7.9%) and San Francisco (-7.0%). Only two major markets experienced minimal rises in their delinquency rates - Chicago (+0.6%) and New York (+0.2%). Only 18 states experienced yearly increases in their delinquency rates led by Mississippi (9.6%) and West Virginia (8.5%). Massachusetts had the largest yearly decline (-11.6%) followed by Florida (-5.3%), California (-5.2%) and Idaho (-5.2%). TransUnion reported 354.79 million credit card accounts as of Q3 2014, up from 333.72 million in Q3 2013. Viewed one quarter in arrears (to ensure all accounts are included in the data), new account originations increased 22.15% to 13.51 million in Q2 2014, up from 11.06 million in Q2 2013. TransUnion's latest credit card report also found that the non-prime population (those consumers with a VantageScore® 3.0 credit score lower than 661) represents a larger portion of all new credit card loans at 36.0% in Q2 2014, up from 30.5% in the same period last year. 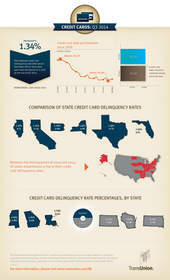 Five years ago (Q2 2009), the non-prime population represented 26.7% of all credit card originations for that quarter. TransUnion's report also noted that the subprime population increased from 13.8% in Q2 2013 to 17.1% in Q2 2014. "While more non-prime and subprime consumers are receiving credit cards, we have not seen a major impact on the overall delinquency rate," said Guitart. "We will continue to monitor this situation as more subprime lending in the credit card space is generally followed by an uptick in delinquency rates."